Got back from the Nuffnang Asia-Pacific Blog Awards in Singapore about two weeks ago but I still haven’t gotten around to posting. I confess, I haven’t even started sorting my photos yet, so even if I have gajillions to share, it won’t be anytime soon. 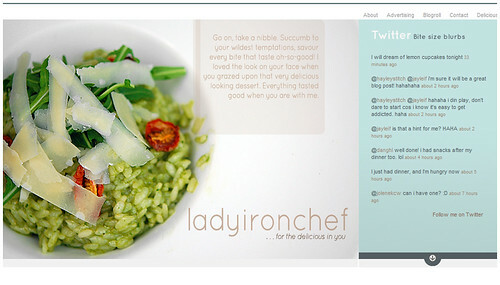 Still, one thing I wanted to do when I got back was a link-luvin’ round up of all the food blog finalists. We were seated together during dinner, and while it was a bit difficult talking to each other because of the program, it was still fun sharing anecdotes and stuff. If would be awesome if you guys can get to meet them too, but I guess the best we could settle for is knowing them through their food and their blogs. The evening’s winner was i eat • i shoot • i post. Leslie, the man behind the blog, is actually a doctor. Who would’ve thought that a doctor would espouse all those evil, evil calorific delights? Well, he does. And actually, going through his blog, it all makes sense. “Never waste your calories on yucky food,” his blog tagline goes. I’d toast to that! Then, there’s my roomie, Meena, of A Whiff of Lemongrass. Unlike me who’s never been to Malaysia, she has actually been to my country! And she professes that her family loves Purple Yam Ice Cream, or what we call Ube Ice Cream. How cool is that? Brad of Lady Iron Chef was there also. It was interesting to meet the person behind the very beautifully photographed and designed blog, especially since he was also wielding a point and shoot that evening. I guess everyone wanted to take a night off from photoblogging duties? 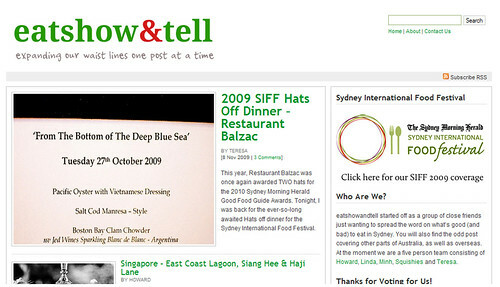 Eat, show and tell also flew in from Sydney. There’s actually five of them and we got to meet three: Harold, Qing and Teresa. 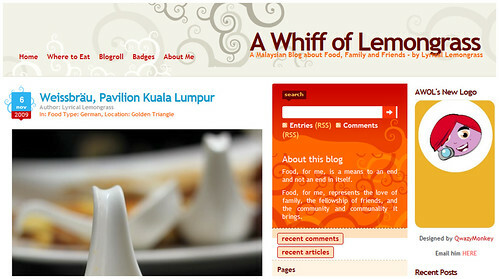 I think it’s pretty cool that their group of friends keep the blog together. That definitely makes eating out loads of fun. We were happy for Leslie that he won. Honest! Honestly, despite not winning, I felt like I did, just being with these people. Bloghopping through their blogs, I was in awe. How the heck did I manage to get in there with them? Mind-boggling! 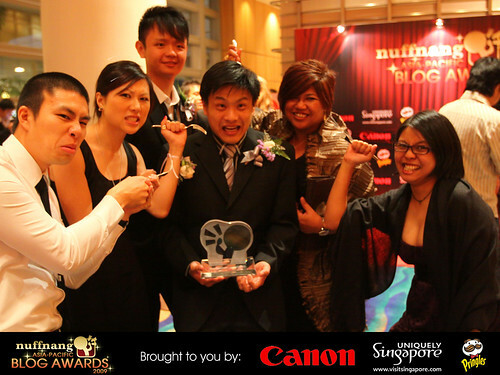 Photo taken from the official Nuffnang Asia-Pacific Blog Awards photostream. To the lovely ladies of Marriot Guam – Shoko-tan, Airi-chan, Shinako-chan and Ms. Pan: Thank you so much for the lovely presents! I love everything! And most of all, thank you so much for the support you’ve been giving this blog. I can’t express my gratitude enough. Maraming salamat! / Thank you very much! / Arigato gozaimasu! This entry was posted in culinary events, link love. Bookmark the permalink. I always look forward to passing by your site as it always offers me new foodie ideas that I’m sure keep stay-at-home moms like me very busy (yet happy!) in the kitchen. More power to Kitchen Cow! And keep those lovely bento ideas coming! You’re still a winner for me Kao. Haha you’re always a winner! late reply to this post, but… CLEAVAGE! hehe! congrats, though for getting nominated. next time, i’ll make sure i vote more. that’s what office internet connections are for. hehe! your story sounds so exciting! congrats for being nominated! you’re always a winner for me, i love you blog! “Limited choices” is a good assessment. My group and I rather enjoy this game. The artwork is very nice, and the silly plays on names are fun. I think the mechanic is promising; there’s little I would change about the rules. However, it gets old fast, only because there is so little variety in the decks. Many cards are repeated several times, for no good reason that I can see. An expansion would help, but it doesn’t feel fair when much more variety could have been included in the base game. Dear Dr. Poses:Frankly, I find your definition of a "health care professional" to be exceedingly narrow and your assessment of these individual's backgrounds to be incredibly biased. Biomedical expertise absent business skills is as dangerous a combination as business expertise without an understanding of medicine and biology. The idea that ONLY those with clinical experience can manage health care organizations is ludicrous.